Don’t have time for this presentation? You're getting my simple, Maximum Efficiency Model swing learning program that fixes the golf swing mistakes that are killing your game. This swing will add 20-40 yards to your drive and get rid of your slice or hook even if you are over the age of 50, weak, or injury ridden. Implement this swing and you will gain an unfair advantage over your golf buddies trying to improve their golf game with other techniques. These performance based training drills have been proven to lower handicaps and help you focus on the aspects of your game that need the most work. All of these drills are done by PGA tour professionals. Once you start these performance based training drills, you will look back at how you used to practice and laugh at the incredible difference. Your personal player locker is completely personalized just for you. In here, you can save your favorite videos. You can upload and store your own golf swings. You can use our incredible line drawing tools to see where the flaws are in your swing compared to my Maximum Efficiency Model. 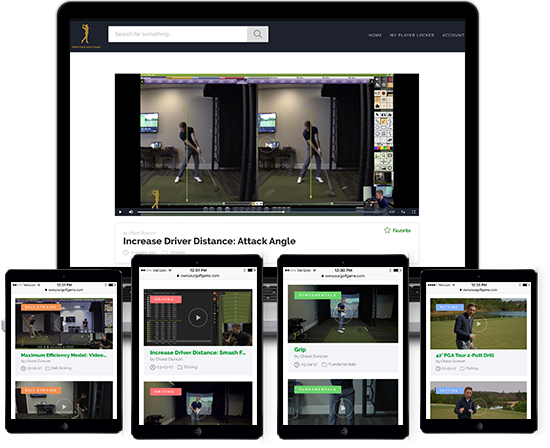 You can put your videos side-by-side or overlayed on top of each other with your old swings, with golf pro swings, and with my swings, to see the differences. You can track all of your performance based training drill results to see how you are improving and what still needs work. You can track your live round scores including fairways hit, GIR, and putts. 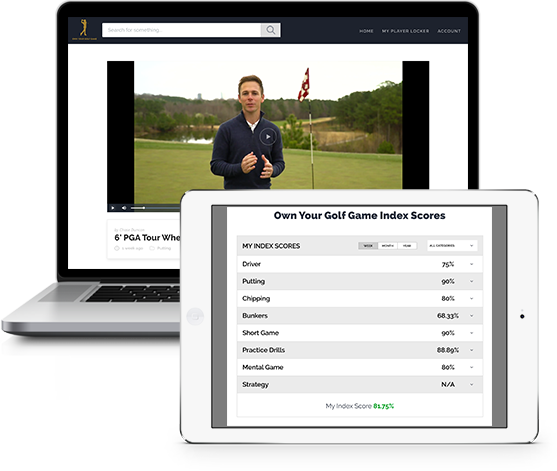 Ready to own your golf game and lower your handicap? To make this a total no brainer for you, I’m giving you 2 bonuses when you get started today... completely free for you. Simply as a way of saying thanks for putting your trust in me. 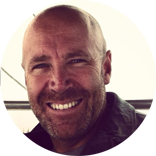 Join me, Chase Duncan, live for an exclusive monthly 1 hour webinar. 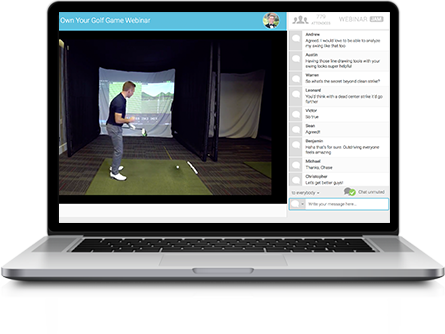 This intereactive golf learning experience is a great way to have any of your golf questions answered and explained. 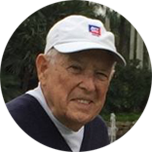 I will go in detail and show you how to fix anything that you are struggling with from distance, to slices and hooks, to lag, and even the mental aspects of the game. This is one my favorite parts of the program. 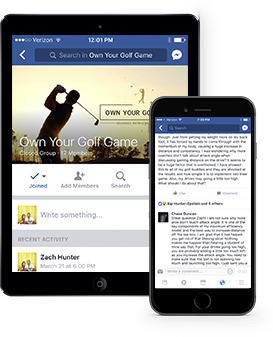 Not only will you have access to me and my team, you will also be a part of my entire network of golfers just like you. If you ever have a question, just post it to our private Facebook wall and within minutes, someone will be answering you and helping you out. YES, I’m ready to start driving the ball 20-40 yards further and dead straight with accuracy and consistency! Give me instant online access to Chase Duncan’s Maximum Efficiency Model Swing Online Training Program! 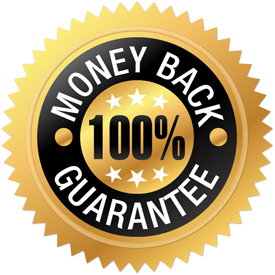 You Are Covered By My 30 Day 100% Money Back Guarantee! 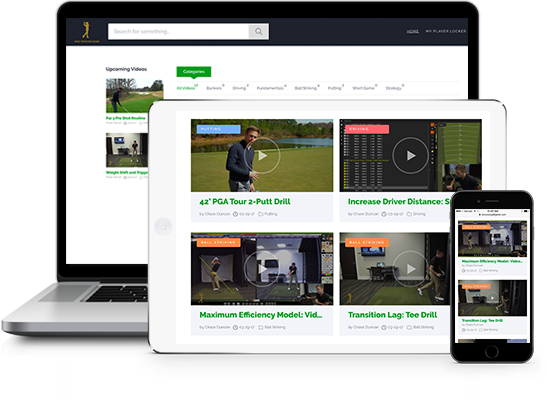 Go ahead and try out the Maximum Efficiency Model Swing Online Training Program for a full 30 days! Watch the videos on your computer, tablet, or smartphone. Go through all of them and then apply what you’ve learned from the videos, and I guarantee you’ll be hitting straighter and farther than ever before... and breaking whatever glass ceiling scoring barrier you’re up against. If for any reason you are not completely happy with the distance you’ve gained..
And with the dead straight accuracy you’ve developed.. Simply send me a email to chase@ownyourgolfgame.com, and I will give you a full refund. That is how confident I am that this program will help you hit longer, more accurate, and more consistently. Real People, Real Results! You’re Next! In just a few minutes, Chase has unlocked an extra 40 yards on my driver that I didn’t know existed! Chase has given me my distance back and I am striking the ball with extreme consistency! In two hours you got me hitting positions I haven’t been able to hit with 35 years of lessons. Ready to switch to the Maximum Efficiency Model Swing & start playing the best golf of your life... even if you’re over the age of 50?